What is the Correct Seating Posture and Chair Adjustment to Adopt to Minimize Risk Factors when Seated? Arm rests (either on the chair or mounted on the work surface) can also be helpful as they can assist in taking the load of the weight of the arms off the shoulders. This will remove a source of bad posture and relieve the strain on shoulder and back muscles from supporting arm weight. Why is Improper Seating Posture and Chair Adjustment a Risk Factor? If adjustments or usage of the chair is incorrect, circulation can become impeded and muscle fatigue and cramping can occur. 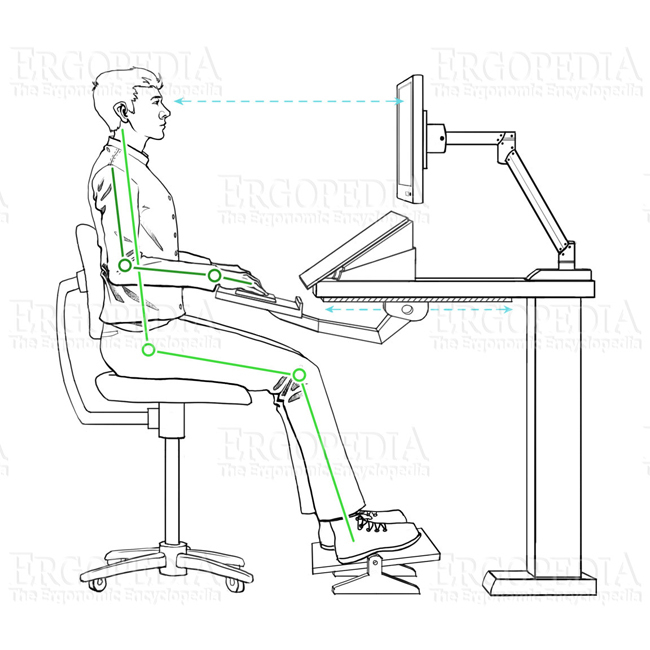 How Close to Ideal does the Seating Posture and Chair Adjustment have to be to avoid it being a Risk Factor? There is a fair amount of variance in tolerance to poor posture throughout the population. However, individuals know when they are experiencing discomfort, although they may not always realize it is the chair. For some individuals, even being slightly 'off' is sufficient to be a risk factor if it causes pain and discomfort, but this is something that varies widely from person to person. What are the Symptoms of a Chair which is in the Wrong Position or Improper Seating Posture? Symptoms to look for include forced shifting of weight distribution in the chair's seat to address lower back pain/discomfort or pressure points on the seat or underside of the thighs, or moving of legs to relief stiffness, numbness, aches or pains.